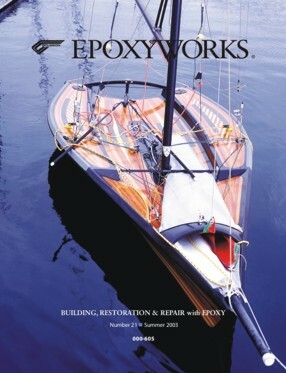 When Meade Gougeon asked me if I’d write a piece about what I’m up to for Epoxyworks, I was honored. He had read the January 2002 article on my single-handed skiff in Sailing World and offered the assistance of GBI (Gougeon Brothers, Inc.) to do some extensive testing for us on several composite samples. The findings will be made public and should be educational. The cedar-cored samples particularly interest me because we’ve had good success using cedar cores and there seems to be a pervasive lack of understanding regarding this composite in high-tech applications. While many high-quality ski and snowboard manufacturers have tried other exotic cores, most have returned to wood. My guess is that testing will support the contention that neither foam nor Nomex™ works as well as wood for maintaining consistent flex characteristics through a high number of load cycles. We’ll see! 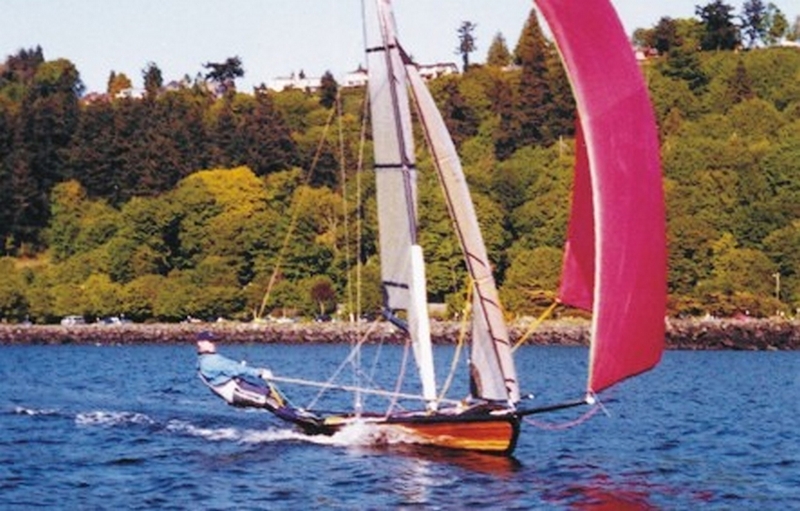 The chain of events that led to my development of the Swift Solo single-handed sailing skiff started in July 1999, after a day of competing in a 49er skiff regatta in the Columbia River Gorge. While watching Kris Henderson sail his 49er alone in about 4 knots of wind, I was taken by how fast a 49er can move in really light air with just one person on board. Since the jib was self-tacking, he kept the main and spinnaker sheets in one hand and was able to jibe quite easily. It occurred to me that, with a cleat on the boom for the mainsheet and a single sheeting system that controlled both jib and main, he would have been able to concentrate on flying the kite from the wire. Since kites had already been added to some cat-rigged single-handers, it was apparent to me that the real remaining limitation was the lack of a jib. Without a jib, single-handers would likely remain difficult to sail, and the size of the spinnaker would be limited by balance issues. The forward mast position required to balance catboats becomes a problem when you turn downwind and hoist a kite-especially with the needle-nosed shape of high-performance skiffs. The Swift Solo in action. The complicated rig is designed to be managed by one person while hanging from the side of the boat. The search for a solution led me to develop the Swift Solo. Initially conceived as a single-handed trainer for 49er sailing (and sometimes referred to as a 24½er), the Swift Solo is a 14′ 4″ sloop-rigged skiff with a masthead asymmetric spinnaker and a self-tacking, self-trimming jib system. The boat combines traditional and modern materials. The hull and deck of USA 001 are strip built with bead and cove western red cedar strips covered by two layers of E-glass. The strip-building techniques provide a traditional beauty that is rarely seen in high-tech applications. USA 001 weighs 235 lb. all up, has exceptional speed, has been sailed (and crashed) extensively, and still looks and sails as good as it did the first season. In the winter of 2001/2002, I built USA 002, re-engineering the composite and replacing the E-glass with a single layer of S-glass on the outside and carbon/Kevlar™ hybrid on the inside. The objective was to reduce the weight by 35 lb without sacrificing strength. S-glass (actually S-2) is also transparent and handles the same as E-glass, but provides about 40% higher tensile strength, 20% higher modulus, and greater abrasion resistance. A single layer of 9 oz material could replace two 6 oz layers of E-glass. The inside is an air chamber, protected from impact and abrasion, so for this application I chose 5.9 oz carbon/Kevlar™ hybrid to replace the two layers of 6 oz E-glass. The carbon strands run athwartships and the Kevlar longitudinally across the load-bearing bulkheads. This orientation eliminates any danger of fracturing the carbon. Given the early success of the Swift Solo, I now have more ambitious goals in mind. In addition to wanting to produce the fastest easy-to-sail single-handed skiff in the world, I feel circumstances are right to build an international class for racing this boat. To be successful in the long term, this class will need to have fairly flexible one-design rules and to produce boats with longer competitive life expectancies than current high-performance skiffs. Business demands forced me to quit sailing for 18 years until I retired from homebuilding in early 1998. Sailboat racing was never a sport that I could do half-way and coming back to a fleet of 49ers rekindled my fire for the sport. To entice my wife Jane to go to some regattas, I got her involved in sea kayaking. We rented a number of glass production kayaks before someone convinced me to build a boat using cedar core and E-glass with epoxy. My neighbor and best friend (a dentist) decided to build one at the same time. We bought copies of Nick Schade’s The Strip-Built Sea Kayak and started boats in our separate garages. The result was two beautiful kayaks that are about 15 lb lighter and significantly stiffer than the boats we were renting. As with the first Swift Solo, the outcome of our work far exceeded any woodworking talent either of us actually has. Much of the credit belongs to the Schade’s book and to WEST SYSTEM® products-“craftsmanship in a can.” When building my single-hander, it was only natural to use epoxy and strip-building techniques. Those interested in building the Swift Solo can get plans, template patterns, parts packages, a detailed 73-page construction manual with photos, and technical assistance during the construction process from us. The International Swift Solo has details. The cedar strips are readily available or you can cut your own. We specify WEST SYSTEM epoxy and provide suppliers’ names for the S-glass, carbon, and hybrid. We have sold 18 sets of plans, templates and manuals over the last year and anticipate greatly increased sales of plans and template patterns as people see the boats in action. We estimate construction requires 300-450 hours. For what it’s worth, the strip-built sea kayak I made before starting my first Swift Solo was much harder to build because of the severe compound bends, but the kayak took a bit less time overall. If you have any experience in woodworking, you can build this boat. The process is easy, and working with cedar is very pleasant and forgiving. Most high-performance sailboats cannot remain competitive over time because they quickly lose their stiffness, a source of a great frustration among serious sailors. A bit of history of the 505 class of sailing dinghies will better explain this issue. In the 1970s, I raced in a large Seattle 505 fleet with very good sailors who eventually won three Olympic gold medals, a silver and two bronze. During that time, I became aware of the inherent differences in boat speed that were associated with various hulls from the same mold. I had imported 56 boats from the largest manufacturer of 505s in England and owned four of this manufacturer’s boats over ten years. During this time, two things had become apparent. First, a new boat would likely move any team up in this large fleet’s standings, even though we were all using our own sails and blades. Second, occasionally someone would get a new boat that would move them well forward (or far back) in the fleet overnight. In 1975, my crew and I received one of the fastest hulls to come to the US during that era. The manufacturer had asked if I’d be interested in an aluminum honeycomb-cored hull they were experimenting with. While Seattle had many better teams than ours, for three years none was faster. The boat was a rocket and remained fast until I made the mistake of selling it in order to take delivery of a new boat just prior to the 1979 World Championships. The new boat was part of the other end of the spectrum from the beginning. Neither I nor any subsequent owner could make this boat competitive. Even with the sails, rig, and blades from the previous 505, the boat was a dog. At about the same time, Mark Lindsay produced a boat using epoxy and Kevlar with a wood-cored deck and seat tanks that made its debut at the 1979 World Championship in Durban. Prior to this, 505s were using polyester resin and E-glass for everything but the deck. None of us was prepared for what happened. A couple of little-known sailors (at the time) smoked everyone with boat speed and won the regatta—the first time for an American team. Mark Lindsay and Larry Tuttle teamed up to produce boats that won several consecutive World Championships. These new boats were expensive and it seemed clear to most 505 sailors that the cost of sailing competitively had just increased substantially. However, almost 20 years later, these Lindsay/Tuttle 505s from the early 1980s were still placing in the top five at world championships! The actual cost of sailing a Lindsay/Tuttle 505 over the years had been far below previous levels—the opposite of our predictions in 1979. These hulls, which had used epoxy, Kevlar and wood, maintained their stiffness and long-term competitive edge. Lindsay and Tuttle’s work on the 505 will likely prove to be one of the more historically significant contributions to the sport of high- performance sailing. Since returning to sailing, it’s become clear that the competitive life expectancy of sailing dinghies and skiffs is generally even shorter now than it was in the 70s. In most high-performance one-design classes, few “top 10” contenders would consider racing a boat more than a year old in a major regatta. It would be easy to blame the builders for this problem, but the reality is that construction techniques are driven by market forces. Experience has shown that a significant part of the worldwide market would rather pay $16,000 for a boat that’ll remain competitive for a year than $19,000 for one that will stay at the top of the game for ten years. The manufacturers have been catering to this low price market demand. 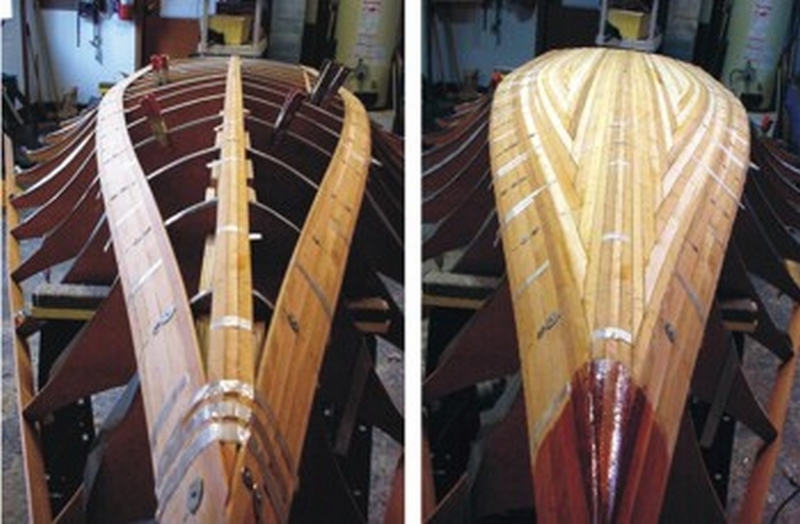 A Solo’s cedar-stripped hull construction. The light, stiff cedar core ahs proven to be durable and it adds an aesthetic quality no other core material can. In the US and a few other countries, it appears that the sailing community is undergoing a paradigm shift. The disposable boat mentality seems to have run its course as sailors become better educated and frustrated with the associated high long-term expense. The Lindsay/Tuttle experience provided convincing evidence that high-performance boats can be built to last for a long time at the top level. As with the ski industry, builders will likely be slow to react to subtle market forces. After all, it’s never been a matter of boats falling apart quickly, but rather a less quantifiable process of losing that last tenth of a knot of speed. That loss adds up to a hundred yards for every half hour of racing. This degradation is easily denied by manufacturers and the blame transferred to other issues; however, strict one-design classes at the Olympic level have left little doubt. The loss of speed is caused in large part by deteriorating composite stiffness due to flexing. Internal compression problems where mast steps, bulkheads and centerboards disburse loads to the hull and deck are likely responsible for the remaining loss of speed. Water retention, a common but easily identified problem in most skiffs, contributes as well. In the end, it will be the accurate analysis of composite samples that will lead to minimizing degradation. While initial stiffness is important, production of boats with composites that perform consistently through thousands of flex cycles is critical if we want classes to grow and keep the long-term costs of competing in check. There’s little need to replace a boat if a new one won’t improve results. We plan to begin production of the Swift Solo soon, initially building our plug and mold and several Nomex™-cored carbon/Kevlar™ fiber hulls. Test results from samples sent to Gougeon Brothers, Inc. will be used in making our final decision on construction methods; however, our boats will be made from materials that ensure the longest competitive life expectancy. The decks will almost certainly remain S-glass on the outside of a cedar core and either carbon or carbon/Kevlar on the inside. From what we know now, the hulls will likely be S-glass on the outside of a Nomex core with carbon or carbon/Kevlar inside. This combination will place the cedar-cored composite where the large compression loads exist (the deck) and the Nomex™ composite where the tension loads are high. The benefit of the Nomex core is that the female molds used with it generate really fair hulls, and since the flexural component is fairly low (it’s under tension from the rig) the Nomex should hold up as well as the cedar. Because of the light weight of the Nomex core, we will be able to increase outer skin thickness to duplicate the dent resistance of the cedar core. Some relatively simple testing has already been completed on a number of samples, and results can be seen on our website. Impact (dent resistance), load, and water-retention tests are fairly easy to complete in a workshop environment. The level of degradation caused by repeated flexing is not. The testing to be completed by GBI will provide answers to this most important issue. Included will be some ¼” cedar-cored samples with various combinations of S-glass and carbon or Kevlar™. Several ” Nomex-cored samples with carbon and Kevlar will be tested for use in hulls. 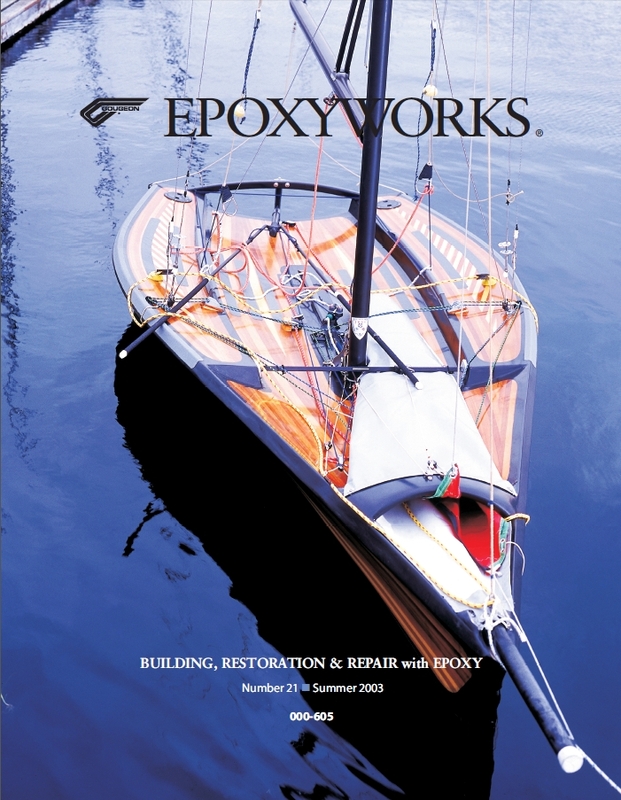 Samples from 49ers will be used as a reference point as I believe that the epoxy/foam/E-glass used on this boat is superior to the majority of manufactured boats on the market. Stay tuned for the results. With luck, we’ll gain some insight that will contribute to the quest to build better boats. For more details and photographs of the Swift Solo, see Danielle Dignan’s article in the July/August 2003 issue of WoodenBoat Magazine. The Bram Dally research at Gougeon Brothers, Inc. centers on the ASTM D6416 Hydromat test method, which was developed at GBI. The testing has two phases. 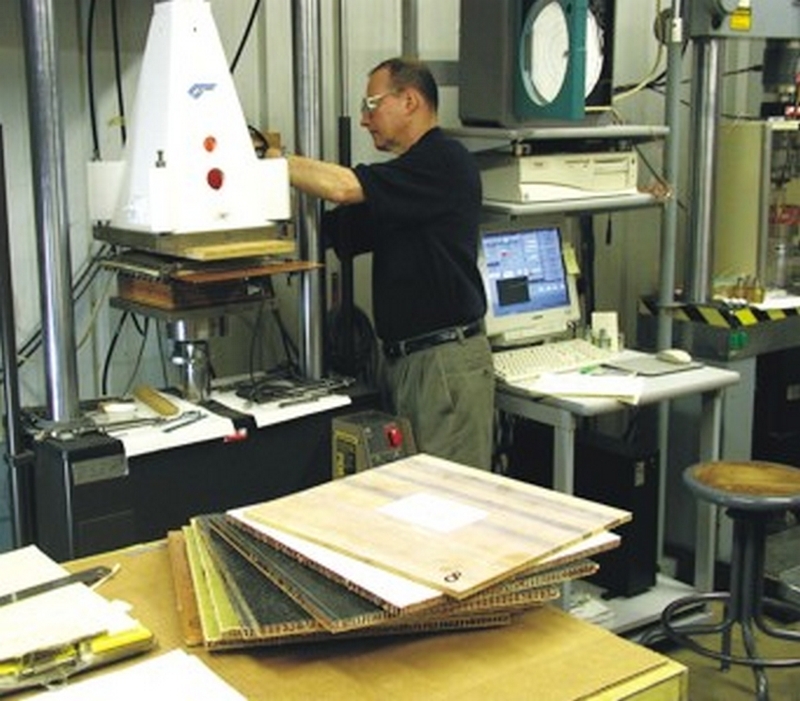 In the first phase, fourteen 12″ × 12″ sandwich composite test panels with various cores (including wood) were subjected to a moderate pressure load to determine their relative two-dimensional stiffness. The focus was on how much a given panel bulged when pressure was applied. The output of this exercise is a pressure vs. deflection graph for each individual panel. The relative stiffness of the panels will be determined by a comparison of the slopes. The steeper the slope of the pressure vs. deflection graph, the stiffer the panel. 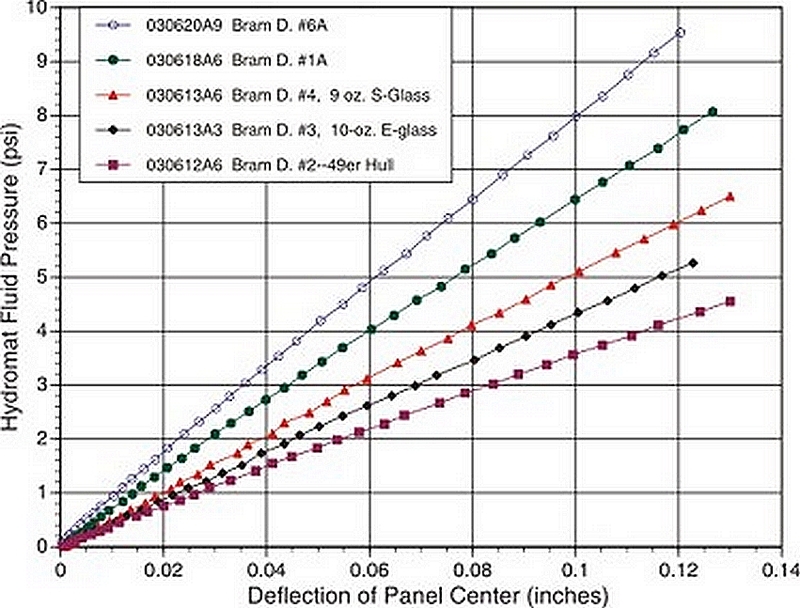 The graph shown above is a comparison of five of the panels, selected to demonstrate the range of stiffness. A stack of Bram Dally’s 12″x12″ composite panels are ready for phase one testing as Bill Bertelsen adjusts the hydromat fixture. The panel with the greatest stiffness overall, #6A, is built of ” honeycomb core with one layer each of 5 oz Kevlar and 9 oz fiberglass cloth on each side. The panel weighs 246 g.
The panel with the most deflection in this group and overall (the shallowest slope in the graph above) was the section of 49er hull built of epoxy/E-glass over a foam core. The second best panel in this group, #1A, is ” honeycomb core with a layer each of 5 oz Kevlar and 6 oz glass on one side and a layer of 5.8 oz carbon cloth on the other. The two intermediate panels are variations of ¼” cedar strip core with glass skins. The remaining panels, not plotted in this graph, fell between #6A and the 49er hull. ASTM D6416 Hydromat Pressure vs Deflection, small deflection ramps. The plots show the relative stiffness of five variations of12″12″ sample composite panels. The second phase, yet to be scheduled, will be to use the same Hydromat system to apply repeated (cyclic) pressure fatigue loads to the various panels in order to determine which panels are best able to maintain their original stiffness. It is hoped that the second phase will reveal the relative durability of the various sandwich compositions.